How can we make sure our voices are not shut away? How do we make ourselves seen and heard? 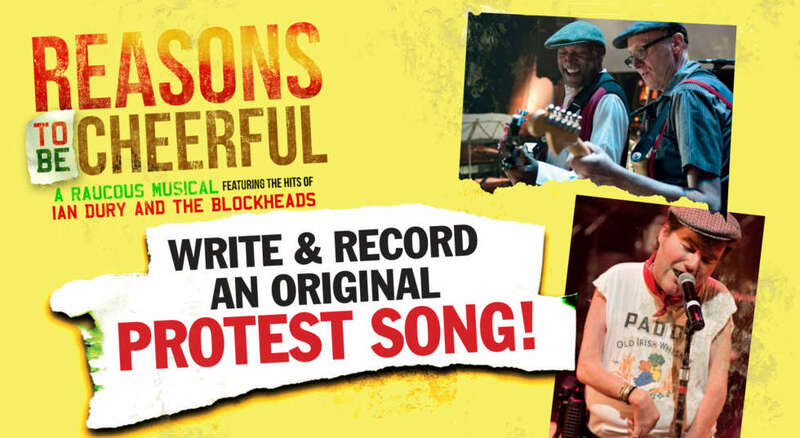 Check out our #protestsong hub for the latest release of songs. Book an optional Introductory Reasons to be Cheerful workshop to set you on your way. Take a look at our Reasons for the Rhyme exclusive Songwriting guide, full of professional song writing tips and ideas of how to make songs accessible. Make an original protest song*. Send it to us. We’ll be choosing songs to take on tour; firing up audiences around the country! Download our #ProtestSong Submission Guidelines here. Come see the show on tour and join the revolution. * We will welcome songs in any format accessible for you, including signed song, lyric videos and audio recordings. In 1981 Britain was changing – we were on the edge of massive political change, music was continuing to present the changing landscape, and D/deaf and disabled people were rising up. In the same year, singer-songwriter Ian Dury (of Ian Dury and The Blockheads) penned Spasticus Autisticus, an anti-charity protest song against International Year of Disabled Persons, a concept he found patronising. 36 years later, the UK is again undergoing massive change, and globally the world is a different place, with new shifts in power and a new generation rising up to be seen and heard. Song continues to be a way we channel anger, maintain solidarity and demand change.